Reuniting with streetwear’s most famous pioneer for Fall/Winter 2015, adidas Originals has worked with NIGO to create another collection with the Japanese designer’s unique style perspective. Once again, NIGO has dug into the adidas archives, reinventing classic heritage pieces with head-turning graphics and the clean contemporary style that he is famous for. The collection is launched via a lookbook featuring award–winning UK Grime artist Stormzy. 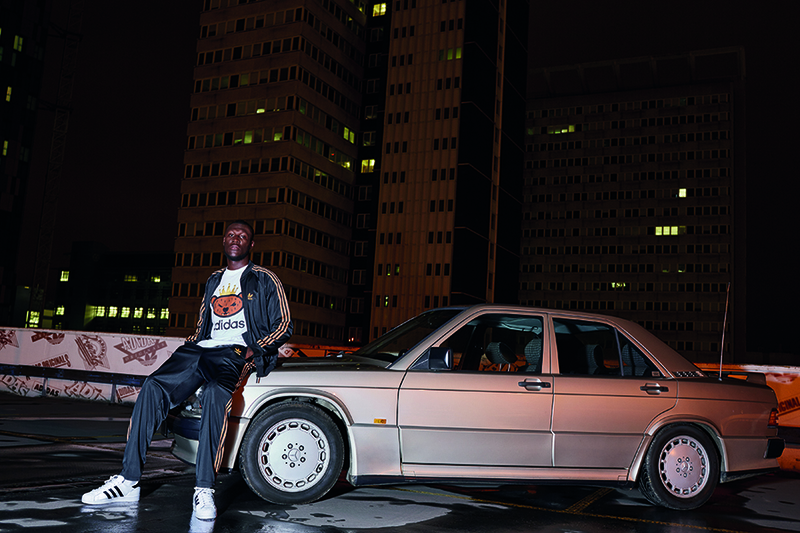 Pinpointed by NIGO as an exciting emerging artist, Stormzy and his crew were shot on location in Croydon, London wearing items from the new season, bringing it to life via an energetic night out. Highlight pieces from the season include the adidas Originals x NIGO bear graphic, which makes its return in a new brown rendition across a selection of crewneck sweats and satin bomber jackets in signature streetwear colours. The pack also offers another adaptation of the classic three-stripes motif with striped t-shirts and zip-up hooded sweats in essential adidas colourways. Completing the picture, the release offers three exclusive iterations of the Campus 80s model in pink/white, gold/black and white/green colourways. True to the philosophies of both NIGO and the brand with the three-stripes, the range is a fluid blend of classics, colour, and the uncompromised character of NIGO.